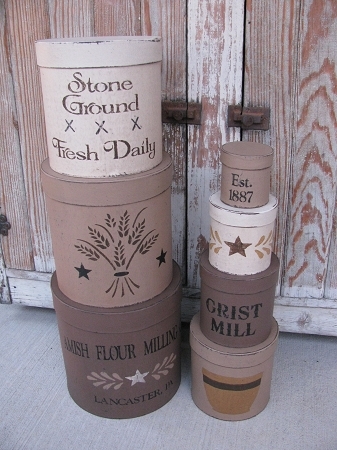 Primitive Amish Flour Mill Set of 7 Stacking Boxes. I've hand painted and designed this set with an old flour mill/baking theme. Love the warm neutral colors in this set. I used Mississippi Mud (which is a dark tan), khaki tan, and marshmellow. All boxes have been sanded and stained for an antiqued look. The bottom box is Mud, with Amish Flour Milling Co, a wheat and star design, and Lancaster, PA on the bottom. The next box has a wheat bundle stenciled on with 2 stars on the khaki tan color. The third box from the bottom is a new color, Marshmellow, which is warm and prim once stained up. That one reads Stone Ground, Fresh Daily. Top for have a yellow ware mixing bowl, Grist Mill, the wheat star motif and lastly Est. 1887. I love the new color way and the warm rich look they have. Stacked up with all 7 boxes measures 42" and the bottom box is 9" in diameter. Or break the set up and display in other fun ways! Hand painted, designed and signed by Heidi at Gainers Creek. August 2014 Country Sampler featured item.